Flow can mean so many things. From the movement of water in a river to the dance of life itself. To feel that you are in the flow is a state of clarity where you are aligned with yourself and your surrounding. Here and now, ready to enjoy life and find how the pieces fits together in the puzzle. We all experience this from time to time and know about the magic it creates in our lives. In AcroYoga vocabulary a flow is also a sequence of movements. A flying flow, a partner flow, a trio flow or even a thai massage sequence can be called a flow. 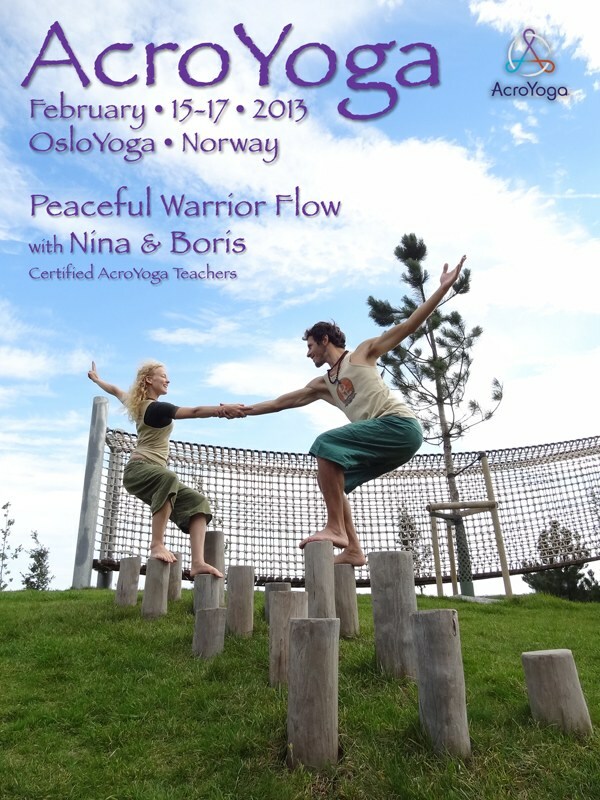 This workshop is based on a sequence we call the Peaceful Warrior Flow. Elements of asana, partner flow, flying and with inspiration from our backgrounds in dance and kung fu. A simple and beautiful flow to connect, balance and awaken our inner balance and power in a playful and inspiring way. Friday class will be open to all levels, so if you are curious it is your chance to come and try. On Saturday we will go a bit deeper into the different elements and details used in the sequence. Sunday we will bring all the pieces together so that we can connect with the material, each other and feel the flow. Come as you are, this workshop is designed to suit both curious beginners aswell as experienced AcroYogis looking for some new inspiration. For the full weekend we recommend that you have some yoga experience, are familiar with working with movement in general and inversions like shoulderstand and headstand. Friday class will be open to all curious. No partner necessary, we work together in different group constellations and also in a circle with everyone present. It is ok to come only Friday, Saturday morning OR afternoon but Sunday is only for those who have come for the whole thing (or minimum all Saturday). This becuase we really want the participants to have a very unique experience with this workshop that builds on a sequence. Friday and Saturday we will go through different parts of the material and Sunday is dedicated to connect everything and feel the flow, so for that you need to have done at least all of Saturday to be able to follow. Sunday: 450 kr pr modul om du også tar hele lørdagen. tilsammen blir det altså 1800 kr. Early Bird 2000 kr until January 27 / After January 27: 2200 kr.